Abstract: In this installment of my column, we'll take a look at the hot topic of Web Services. Publishing your web application interfaces over the Internet is the next great evolution in the developent of distributed objects and applications. What's the newest, fastest growing technology for Internet application developers? For me, it's web services and WSDL (Web Service Description Language). Just about all of the major industry analysts are predicting that web services will revolutionize the way e-Business applications are designed and implemented. They all predict that web services and the development platforms that build them will be a multi-billion dollar business over the next 2 to 5 years. If you take a look at the web services announcements from most of the software companies, you'll also see how important our whole industry feels about the opportunity. WSDL is defined in the abstract section of the W3C WSDL Technical Report - "WSDL is an XML format for describing network services as a set of endpoints operating on messages containing either document-oriented or procedure-oriented information. The operations and messages are described abstractly, and then bound to a concrete network protocol and message format to define an endpoint. Related concrete endpoints are combined into abstract endpoints (services). WSDL is extensible to allow description of endpoints and their messages regardless of what message formats or network protocols are used to communicate, however, the only bindings described in this document describe how to use WSDL in conjunction with SOAP 1.1, HTTP GET/POST, and MIME." As the WSDL description states, WSDL is used with SOAP. Don Box, a noted author, speaker, trainer, and consultant wrote an article titled, " A Brief History of SOAP" Don also wrote a technical article on SOAP, " Inside SOAP". These and many more open, industry standards are keys to the success of web services. Most software vendors, including Borland, IBM, Microsoft, Intel, Sun, Oracle, BEA Systems, Hewlett-Packard, and more, are pushing forward in delivering web service development technologies. Where are the Web Services? Okay, you've read some of the press releases, articles, and specifications. You might ask, "Where's the beef?". Where are the real web services? Where's the WSDL? Here are a few directories that list web services you can use today (some of them are even built using Delphi 6). How can you find out more about Web Services? As always, there are many resources for developers on the Internet. How do you get started? 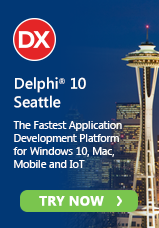 One great way to start is to use Delphi 6's web services technology. Build web applications. Publish the interfaces to the components of your web applications. Anders Ohlsson shows how easy it is to integrate web services into a Delphi 6 application in his article at http://community.borland.com/article/0,1410,27319,00.html. John Kaster interviews, Rick Nadler, Web Services Architect, on the new support for Web Services in Delphi 6 on CommunityTV at http://community.borland.com/article/0,1410,27301,00.html. Nick Hodges shows you how to build a Shakespearean insults web service at http://community.borland.com/article/0,1410,27399,00.html. When I saw the word "Sip" I was thinking the article might talk about the mighty Session Initiation Protocol.